Silver Moon and Silver Moon II are luxury 47ft catamarans, with peaceful indoor cabins forward and aft, immaculate washrooms (separate genders), a cool fresh water shower, and easy access to the ocean. Catch some sun out on the sun-dappled deck; cool off under the shade of the cockpit or sip on a drink in the nautical themed saloon. With a maximum of 12 passengers, you can spend five hours of tranquil bliss indulging in seaside splendour. 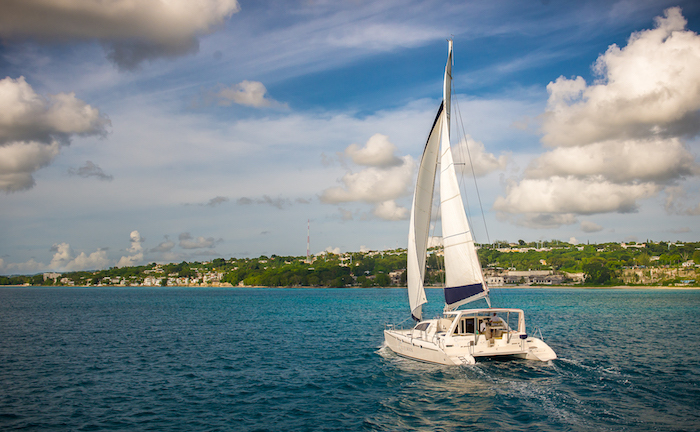 The lunch cruise sets sail at 9:30am, sailing along the west coast making two snorkelling stops, one with the famous Barbados sea turtles and one at a historic shipwreck. Adults: US$115 and kids under 12 US$85. Includes a Bajan style buffet lunch, unlimited drinks, ground transportation, full snorkelling equipment and instruction. Also available for private charter, an exclusive alternative to the share charters, you can customise an agenda of your own. They will tailor their service, catering and exploration to your personal desire. The staff are warm and friendly; each knows the ocean and its many creatures well. Let Silver Moon create a comfortable, hospitable, and unforgettable cruise for you.